Communications Unlimited provides network consulting and installation services. 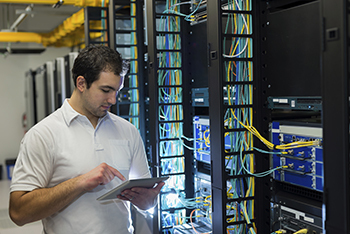 Whether you are a small single location or a multi-site organization requiring a Wide Area Network, we can help you in the design and installation of your network. We partner with Dell, SonicWall, Adtran, Avaya and Cisco Meraki to ensure a superior network installation. Along with the traditional threats of virus and malware attacks, businesses today face increased security risk. Personal wireless devices have brought about the new age of BYOD (Bring Your Own Device). Guest and workers often access business networks with their own devices, increasing the risk of your network being compromised. BYOD will also impact the performance and speed of your network. It is more important than ever to monitor and secure your wired and wireless network. Communications Unlimited, Inc. has the product line and experience necessary to help you design and install a network that can meet today’s new security challenges. Whether you are deploying a new wireless network, or replacing or adding to an existing wired network, selecting the right products is essential to meet your future goals. Today’s software and applications require high performing network cable, switches and servers to function properly. At Communications Unlimited, Inc. we partner with companies that provide superior products and services allowing us to build a superior network that will meet your future goals. We can handle your project from the ground up including the low voltage cable installation. One point of contact eliminates finger pointing and insures that you have a company who will take responsibility for your project and see it through to completion. Contact us today if you are in need of network installation services. We service RI and MA.